Again there is nothing wrong in finding out what their current staple products are, the routines they are doing etc. but at the same time it is important to realize that their hair needs/reacts differently to yours, yes even if you think you have the same “hair type”. What I have started to notice is that whenever a popular blogger loads up “My Current Routine” or “My (current) Favorite Products” videos, A LOT of viewers suddenly feel the need to copy. Trial and error is part of any journey but if you currently have a routine that is working for you, products that your hair loves, where does the need to change everything you are doing to copy your hair crush come from? A lot of the times your hair crush is on their own trial and error, tweaking methods (sometimes off camera) and then they update you with the changes they had to make to fit their hair needs, or inform you that whatever they were doing wasn’t working for them. All the while you already noticed that the method they were doing (you were following), products used, didn’t favor your hair but you stuck with it and now with their update you think “Okay, that is why it went wrong, I need to change it like she did and then it will work”. Even if your hair crush were to make a bold claim such as the products/routine will work for every and anyone, chances are you will find a few people that copied it step by step and their hair is cursing them (and making them for pay it in retaliation)! • You get to find out about a new product you didn’t know existed. • You learn something new about hair, particularly your hair. • The products used are from a new start company and you get to support a small budding company. • The routine might be something you never thought about and you find out your hair loves it. • You strengthen the loving relationship with your hair (yes some of us consider it as a relationship)! • You find that missing link that helps you complete that healthy hair routine you wanted. • You get to hear/see reviews about products you always wanted to try out. • As a new natural you are able to find out more about all the endless hair care possibilities out there. • You are stuck in hair envy (unwittingly). • You end up wanting to change your hair (perhaps subconsciously) because you don’t love what you naturally have. • Your “rocky” relationship with your hair ends up getting worse because you didn’t end up with the results you expected (she had). • The routine simply didn’t work. • You spent a ton of money on products only to find out they will end up collecting dust in your black-hole unused hair product cupboard. • Instead of taking your healthy hair routine one forward you end up going two steps back. • You are following someone that is a (self-claimed) “hair guru” but in reality is only a guru of her own hair. • Your hair crush is promoting a product that in reality is not one of her “must haves” but has been paid to make a positive review. 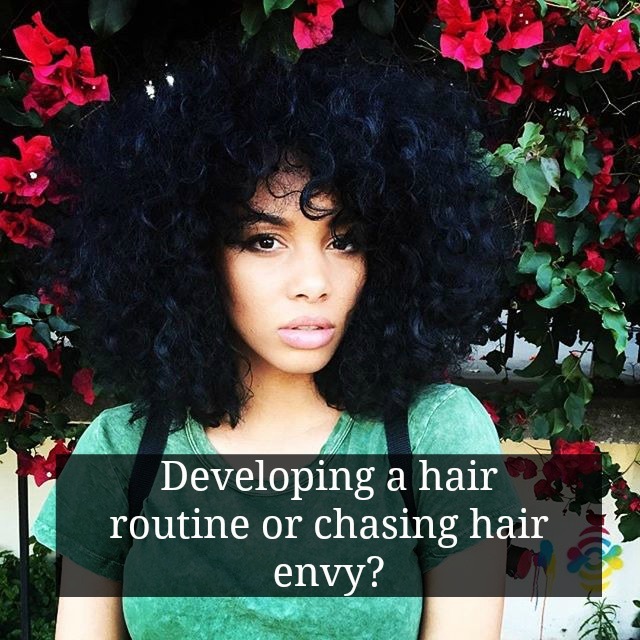 • You spent a ton of time and money chasing a dream instead of working with your own hair and nurturing it. At the end of the day, my opinion is that admiring someone else’s hair is not a bad thing however, admiring & loving your own should be your priority!